If you want to take a photo of yourself and your family on vacation, you don’t have a ton of good options. Selfie sticks are a scourge on the world’s public areas, and should not be used under any circumstances. You could ask someone to take your picture, but you’ll quickly be reminded that very few people are competent at taking pictures. Tripods are an option, but even miniature ones take up considerable space in your bag, and require a flat area at an appropriate height for use. You can always take selfies by hand, but you’ll look like a dummy, and will one day grow to regret having your forearem in all of your cherished vacation photos. Selfie Stick-It isn’t without its own disadvantages, but I think it just might be my favorite solution to this problem. It’s basically just a rubber cradle for your phone attached to a sticky disc that you can adhere to pretty much any surface. It even includes a little Bluetooth remote to trigger your phone’s camera shutter. The Selfie Stick-It’s sticky pad wasn’t even clean, and it stuck to a dusty tree trunk. This was actually the second tree I attached it to. About that sticky disc: It’s really, really good. I loaded up my phone and stuck Selfie Stick-It to walls and windows all over my house, rubbed my greasy fingers all over the sticky pad, and then went outside and mounted it to a couple of tree trunks without incident. Admittedly, after that, the pad did need washing, but a little dish soap and a few seconds under the sink made it as good as new. 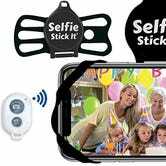 Since it uses a rubber harness rather than plastic pieces to hold your phone in place, you can slip the Selfie Stick-It into pretty much any pocket and bring it with you anywhere. The downside to this approach is that since the angle of your phone is basically at the whim of gravity, you may need to mount your phone fairly high up to frame your shot correctly. The fact that your screen faces the wall also means that it’s difficult, though certainly not impossible, to use the Selfie Stick-It with your phone’s superior rear camera. But hey, it’s a cheap little smartphone-era novelty that solves a real problem without the deleterious societal ills of selfie sticks. It’s not perfect, but it does the job it claims to do, and does it surprisingly well. 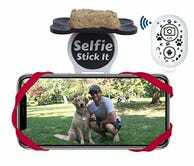 Bonus, they also make a version with a little shelf for dog treats, so that your furry friend might actually look at the camera for once.